Monday – Thursday: 7:30 a.m. until 9:00 p.m.
Friday: 7:30 a.m. until 5:00 p.m.
Saturday (3/23) and Sunday (3/22): Closed. Extensive book shifting is under way at the library. 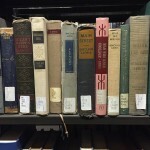 Call number configurations for book and periodicals have been changing.